If you are interested in any of these guitars, please click on the email symbol under the guitar name, to make contact with Steve Pyott to negotiate a mutually agreeable price. This is an unusual German Hopf four string archtop electric guitar based on their 319/320 six string models. You can see an excellent series of Hopf six string guitars in this article and they show some design similarity to this four string guitar: http://jazzgitarren.k-server.org/hopf.html. 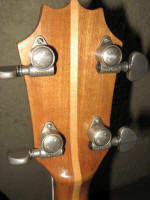 This Hopf four string guitar is not technically a tenor guitar as it has a six string guitar scale length and so it cannot be tuned to regular CGDA tuning. It can be tuned to DGBE, CGBE or GDAE turnings. A guitar collector in Germany contacted me out of the blue about it and asked if I was interested and I thought it was an intriguing four stringed guitar. 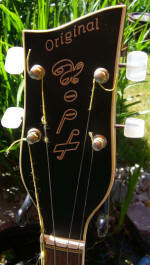 Apparently it was built as a one off custom order by the top luthier at Hopf Guitars, Gustav Glassl. There is an interesting story about this and other makers who were originally located as part of the German speaking population within the Sudetenland in Czechoslovakia and whose 3 million odd German speaking people were expelled after WWll and had to re-locate to Germany. They went to an area in Bavaria and were surrounded by US military bases and guitar builders were able to sell thousands of instruments to U.S. soldiers. 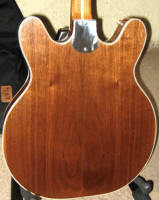 Natural finish spruce top with mahogany back, frame and neck - mint condition. Click each photo for a larger view. All birch construction, glossy brown shaded and grained finish, silkscreened "body binding" and "purfling", celluloid pickguard, non-original ebony bridge - but custom built by a luthier. 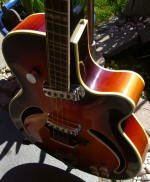 ADeArmond archtop tenor/mandolin detachable pick up system is also available for this guitar - mint condition. Click each photo for a larger view. A six string four-course plectrum length electric guitar with two pick-ups similar to their electric guitar models - it was designed by Eddie Peabody, the famous 1930s plectrum banjoist. It was supposed to be tuned CGBD with the C and G strings in octave pairs and the B and D strings as singles. Although not commercially successful when it was introduced, it is a very interesting instrument that has the jangly sound of the Rickenbacker 12 string electric guitars, It also has a wide variety of tuning options. I usually have it tuned to CGDA using the Eddie Freeman re-entrant tuning CcGgda because of its longer scale length. Click each photo for a larger view. Click email image to enquire about purchasing this beautiful guitar. 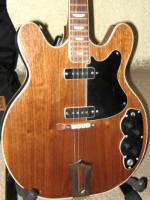 Unknown 1960s U.S. custom-built solid-bodied electric tenor guitar. Click each photo for a larger view. Click email image to enquire about purchasing this beautiful guitar. Brand New Rickenbacker 325C64 Miami C Series Electric Guitar Duplicates the 325 model as produced in 1964 . The British Invasion of 1964 initiated a rise in popularity of the Model 325. The Model 325C64 duplicates the Model 325 as produced in 1964-complete with semi-hollow maple body, reshaped body and headstock, 3 vintage-style single-coil pickups, Deluxe Vintage tuners, and Accent Vibrato. For a detailed chronology of the Rickenbacker Model 325's role in the British Invasion, check out Backbeat Books' "Beatles Gear: All The Fab Four's Instruments From Stage to Studio" (SKU #H64162). Includes hardshell case. A thoroughly collectible guitar that is will appeal to tenor guitar players who prefer a shorter scale length. Click each photo for a larger view. Click email image to enquire about purchasing this beautiful guitar. 2015 Tokai Rebelrockers RG-43 - Tokai's remarkably accurate tribute to the Rickenbacker 330. On its web page for this model, The Rock Inn music store in Mount Lawley, WA, explains: It's no secret that Tokai Gakki Japan make copies/clones of the most famous American guitars of the 20th Century. Tokai have also turned their attention to Rickenbacker, the American Electric Guitar pioneer, making remarkably accurate copies of their more iconic models, and RIC were not best pleased. To this day, it is very rare to see Rickenbacker copies in the United States where RIC rightfully guard their trademarks much more stringently that Fender of Gibson ever did. These modern-day Tokai copies are found in proliferation through Europe and Japan, and thankfully so, as RIC, being essentially a low-volume boutique manufacturer, turn out comparatively few guitars per year and even fewer are made to export. This leaves the RIC lover in Australia very low of options. To buy brand new, if you can find someone who's importing them, will cost you in excess of $3000. Not a small spend. However, it has to be said, even from a regular player (and devotee) of Rickenbacker instruments, that these Tokai guitars are astonishingly close, aesthetically, sonically and from the perspective of sheer playability, and for a fraction of the price. Branded 'RebelRocker' in Australia, due to the exceedingly cheeky European branding 'Rockinbetter' not being used here in Aus (can't think why...), these guitars represent a serious option for the lover of that signature RIC tone. Has to be heard to be believed.